Mark Oakley is one of those workman creators who puts out terrific work over a long period of time but whom you may not be familiar with, because he’s never had that breakthrough moment. His fantasy comic series Thieves & Kings has been going since 1994. Turns out he’s also been drawing a charming comic called Stardrop for a Nova Scotia newspaper for the past few years, and he runs it biweekly on his website. There’s a book version of the comic, and that’s what I am telling you to buy, because it’s a wonderful, silly, insightful coming-of-age story. Achelle is a runaway space princess washed up on Earth, where she makes friends, finds a job, and basically learns to take care of herself. I know that sounds like it runs the risk of being a tad precious, but first, Achelle is the most un-princessy princess I’ve seen — she wears a jumpsuit, not a sparkly dress (or worse, very little fabric and lots of chains), and makes odd little references to galactic battles, since she ran away from military school — and second, her status is a way of providing a fresh take on our culture. Achelle starts out a dreamer. We meet her on a train boxcar, travelling she knows not where, just running away from her dad and his plans for her to rule Earth. But she’s quite self-aware, leavened with the most eye-opening optimism that she can make things work out. (As a realist, I find this inspirational.) She’s learned Earth from media, making for amusing bits of conflict humor as her expectations are confronted with everyday life. Thankfully, she meets Jen, who assumes Achelle’s a motorbike-riding international student (which does nicely explain most of her weirdnesses) and who happens to have a room for rent. The two fit together nicely, since Jen needs some un-normal events to shake her out of her safe cocoon, and Achelle needs someone to point out how weird she’s being. Both are going to change the other’s life in the way they need. The rest of the cast includes Charlen, Achelle’s loser ex-boyfriend who wants to take her hostage for the resistance; Jen’s friend Tom, who falls for Achelle; Groden, Achelle’s bodyguard; and most ridiculous, jealous frenemy Kytanna, who winds up stuck on Earth as well. The story swings from “I will build a transmitter out of a microwave to tell forces not to destroy Earth” to “I got a job at the local bed and breakfast and found out what a cat is!” The latter is one of my favorite moments in one of the best storylines, because it hits on culture clash, a particular well-liked reading element of mine. There’s a whole lot of stuff happening in this book, something for everyone — romance, adventure, comedy, social insight, and growing up. I also like the way Achelle is so disarming. Turns out she’s a military genius due to her unique philosophies, and she’s unafraid to say what she’s thinking. She’s the kind of character I want to read more about, because I can’t predict what she’ll do next, but all of it is entertaining. And I hate to have to note this, but there are so many different kinds of women here, it’s a pleasure to see a story aimed at everyone that just happens to have more girls than boys in it. Oakley’s cast members are very talky, but they’re saying interesting things. And I love his figures, so dynamic. Even in repose, when they’re thinking, they’re posed to show their emotions and reactions. He’s not afraid of backgrounds, either, which combined with the large word balloons, sometimes makes for dense panels, but they give the feeling that he’s built a real world and characters here. It’s spilling over, like life, full of interesting ideas and events. 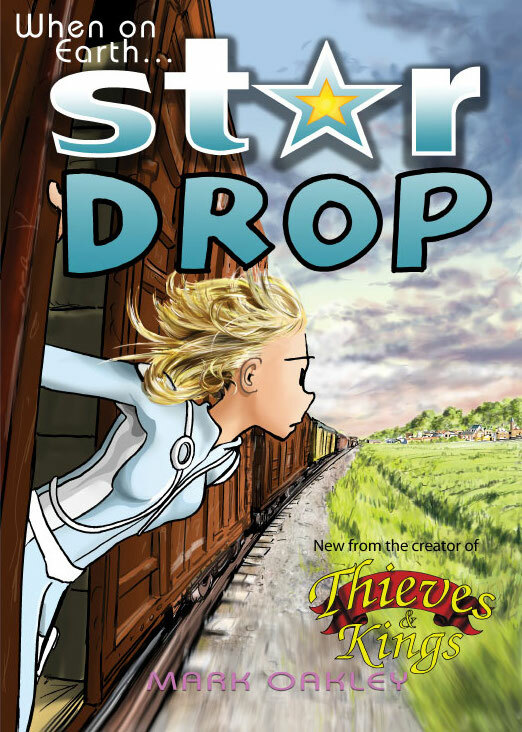 You can order Stardrop from the I Box website, or read more of her adventures there as a webcomic. If you’d like to carry on from this book, start with episode 82. It’s now up to 133 pages (although the web pages turn into several print pages). The text epilogue explains some of the more abrupt changes in the last couple of strips, and I have hopes the second volume will be available soon — I’m eager to read more!